Description: A beautiful ground cover that can either crawl along the ground or grow 3 to 4 feet high on a fence or trellis. One leaf is composed of three oval leaflets approximately 3 inches in length, attached to a long stem. 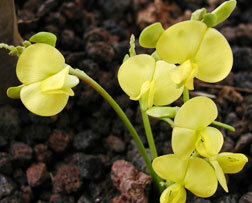 They have pea-type flowers which are bright yellow, an inch wide and arranged in clusters of one to six. The flowers of nanea are striking and hardy, making them ideal for lei. When in bloom, the flowers usually protrude above the rest of the plant, but often can also be found hidden among the leaves. Once pollinated, seedpods develop with two to 10 small, reddish-brown pea-looking seeds about a quarter-inch long. Distribution: This indigenous plant is found throughout the tropics. In Hawaii, it is found on Oahu, Kauai, Maui, Molokai and the Big Island. Its natural habitat is sandy coasts, where it often crawls through other natives such as naupaka kahakai (Scaevola sericea), pohinahina (Vitex rotundifolia), 'aki'aki grass (Sporabolus virginicus) and pohuehue (Ipomea pes-caprae). Sometimes it grows on sea cliffs and dry slopes. Landscape use and care: If you need a fast-growing ground cover, nanea's for you! But be careful of what you wish for, because it really does grow quickly. Plant one every 2 feet to get a nice full cover. It even does well on slopes to control erosion and the flowers add great color when in bloom, which is pretty much continuous. Every-other-day watering is OK, but you should reduce the watering schedule once the plant is established. The plant will be hardier and tougher. Nanea prefers full sun but will tolerate partial shade. Watch out for spider mites that will discolor and eventually defoliate the plant. They should be treated with a pesticide specifically for mites. This plant is available at Home Depot for about $5. Cultural uses: The flowers of nanea are stunning and durable, which makes them ideal for lei. They can be strung in the style of "maunaloa"-type lei. Other info: This plant goes by several Hawaiian names, depending on the island or region in which it is found. Other names include nenea, mohihihi, puhili, puhilihili, pulihilihi, wahine 'oma'o and my favorites -- lemuomakili and 'okolemakili, which mean cracked buttocks, in reference to the look of the open flowers.